In 2008 I become certified Culture Transformation Tools (or CTT shortly) consultant. The tools were developed back in the 90’s, and since than, over 6000 companies world wide have used them to measure their values and culture. In 2009 my team used one of the tools to measure the culture of my country of birth, Macedonia. In the past 10 years some 30 other countries have done national values assessments. Apart from the values, the tools measure the alignment within the culture of the organization, as well as the cultural entropy – the limiting values and behaviors that are not available for productive work. More on this in the Diamond Leadership book. In this context , let me share my experience with you. They are 2 types of business leaders and organizations when it comes to organizational culture. I am not worried about the second type, since the experience shows that they are on the right track in regard to their culture and business. My concern are, many organizations that are in the first type. This group of leaders and organizations are aware of the importance of culture but have never measured it. They might talk about values and culture as important, and they have chosen values on their websites vision and mission statements, but in reality the chosen values are only a distant dream, often very far from the current cultural values. This type of organizations are like sailors without compass, and I personally think that they are counting on luck for their cultures, which makes them gambling with their business results and future. Most of you will say, – “we don’t need to measure culture – we are profitable business”. And I am sure that you are making profit, and perhaps this is your biggest obstacle, since you are not concern about how much you are potentially loosing for your blind spots in the culture. Don’t get me wrong, out there, there are companies that do not measure and still have healthy culture, but these organizations are exceptions, not the standard. Let me give you en example: recently a company decided to measure their culture. The measurement showed a 25% entropy (limiting values and behaviors among employees). This means that every 4th day in this organization is not productive. The audit results, showed that the wage bill for the same organization is 120 Million $. So 25% entropy literally means that this organization looses 30 Milion $ per year on its wage bill in lost productivity!!! You can see how this organization looses millions in a “stealth-invisible” way. 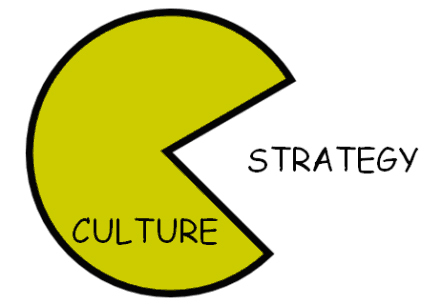 This is how culture eats strategy and your profit every breakfast, lunch and dinner. Now if you are a small business owner, or you are running a medium or big organization I would like to encourage you to start running your business with the “cultural compass”. At least measure the culture once, so you are on the safe side. If you don’t do this, you might be sitting on a potential problem that you can’t see, and costs you a fortune. 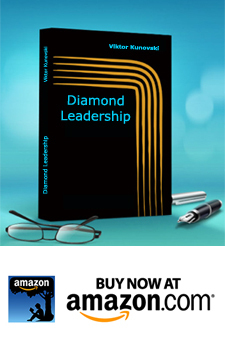 On how organizations measure and manage culture, create alignment see my latest book Diamond Leadership available on Kindle. To measure the culture of your leadership team and your organization please contact me here or via @knowing-circles.